Ledeč nad Sázavou (Czech pronunciation: [ˈlɛdɛtʃ ˈnatsaːzavou̯]) is a town in the Vysočina Region, Czech Republic. It is located at around 49°41′45″N 15°16′30″E﻿ / ﻿49.69583°N 15.27500°E﻿ / 49.69583; 15.27500. The Sázava River flows through the town. 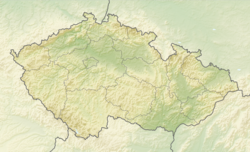 Until 1918, the town was part of the Austrian monarchy (Austria side after the compromise of 1867), in the district of the same name, in Bohemia. A post-office was opened in 1852 (named Ledetsch). Gustav Mahler's mother, Marie Hermann, was born in Ledec on 2 March 1837. On 18 March 1857 she married his father Bernhard Mahler in Ledec. ^ Handbook of Austria and Lombardy-Venetia Cancellations on the Postage Stamp Issues 1850-1864, by Edwin MUELLER, 1961. Wikimedia Commons has media related to Ledeč nad Sázavou. This Vysočina Region location article is a stub. You can help Wikipedia by expanding it. This page was last edited on 21 March 2019, at 23:21 (UTC).